Daughter of the banker Thomas Gibson from Newcastle on Tyne, who never married the mother of his nine children. 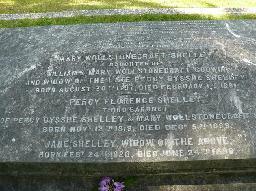 She was the widow of Charles Robert St. John (whom she had married on 20 Apr 1841) when she married Sir Percy Florence Shelley (son of the poet) on 22 Jun 1848. From that moment she was Lady Shelley and she removed many 'dangerous' parts from the Shelley correspondence to protect the family name. 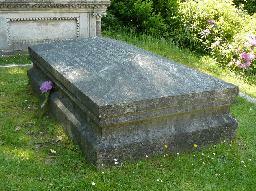 Jane was very close to Sir Percy's mother Mary Shelley. 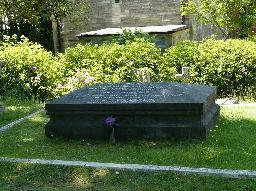 The grave of Mary Wollstonecraft, William Godwin and Mary Shelley at St. Peter's Churchyard, Bournemouth.